This technique was taught to me by Terry Fox some 15 years ago and I’ve used it ever since. What it does is give softness and definition to the armscye seam. 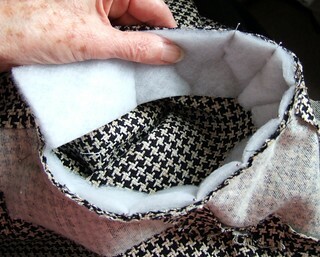 Start by cutting a strip of Volume fleece* 2” wide and about 2” less the length of the seam. Start about 1 ½” from the underarm seam, edge of fleece level with the raw edge and inside the sleeve. Pin in place with pins at right angles to the edge, pin head extending over the edge ending about 1 ½” from the underarm seam.